NEWINGTON - The meals were consumed; the holiday photos all taken; and the crafts the kids made are now hanging on Christmas trees at the homes of hundreds of area residents who attended the Newington Rotary’s recent Breakfast with Santa. Later, as scores of children lined up to have their photos taken, there was one standout moment, Tedeschi revealed. 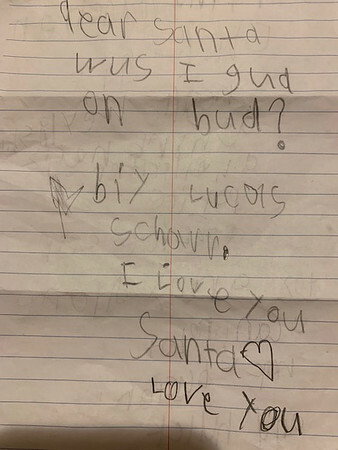 Six-year-old Lucas Scharr, of Newington, handed Santa a letter he had written listing presents he hoped would be under the tree come Christmas Eve. Santa naturally wants to fulfill the hopes and wishes of all the boys and girls who send him letters, but this one written from a different perspective of being naughty or nice had him puzzled, admitted Santa to his Rotarian hosts before flying back to the North Pole. Santa just kept staring at the letter, Tedeschi explained. Lucas had scribbled on the envelop: “I love you Santa, you are the best,” and on the inside were two memo-pad pages containing a laundry list of gifts from robots and helicopters to pajamas and a toy Army drone. 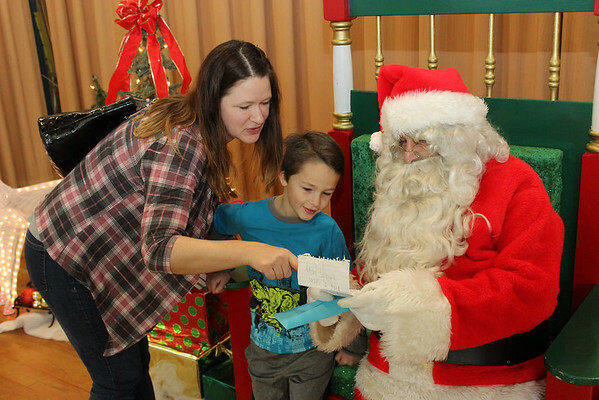 Whether Lucas has been naughty or nice, approaching Santa the way that he did made for a magical moment during the fundraiser, noted Tedeschi. The proceeds from the event benefit the multitude of Rotary Club charities. Newington Rotary is composed of dedicated business professionals and retirees whose annual fundraising projects include collecting food and monetary donations to support the town’s food pantry, providing backpacks and school supplies for needy children, distributing dictionaries at local elementary schools, supporting new programs implemented by the town’s fire and police departments, and hosting an annual golf tournament that benefits its signature charity, the Alex’s Lemonade Stand Foundation, a Rotary project that in seven years has raised more than $150,000 to combat pediatric cancer. Posted in Newington Town Crier, Newington News on Thursday, 20 December 2018 08:23. Updated: Thursday, 20 December 2018 08:25.